A hypoallergenic hair removal cream removes hair easily in just 10 minutes. This lemon scent cream is formulated with natural ingredients such as centella asiatica extract, jojoba oil, and aloe vera leaf extract. It is proven safe by the Ministry of Food and Drug of Korea. 1. Ensure skin is clean and dry, apply a thick, even layer of the cream to thoroughly coat the desired areas. 2. 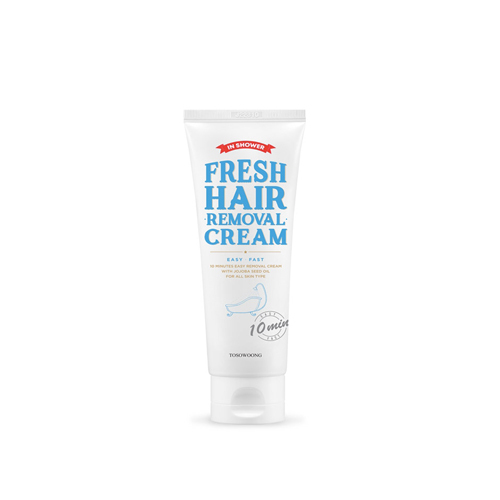 Take a proper cream on your skin and rest 5-7 minutes, and then check with a finger to see if the hair is ready to be removed. 3. Gently massage the body part with a wet towel to remove the hair. 4. Rinse your skin thoroughly to remove the cream completely while taking a shower.